Whoops! Australia's Classification Review Board just rated (and revealed the existence of) a new Burnout game from EA. You gotta love game classification groups sometimes. 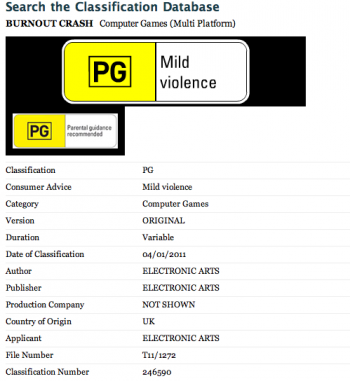 Electronic Arts has been scooped by the Australian Classification Review Board, which recently revealed the existence of Burnout Crash, the latest entry in the popular racing franchise. Currently, all that's known about the game is that it's been rated PG by the group (for "mild violence), as well as the fact that it's being developed for multiple platforms. Presumably, the game is being developed by Criterion, though the classification page lists EA as both the developer and publisher. The franchise has been on hold since Burnout Paradise was released in 2008, though there was a slew of DLC for the game for a while afterwards.